Voices for Creative Non Violence UK are very excited to announce that we’ve received funding to undertake projects in activist skill sharing with 5 refugee groups in the UK, plus 20 Fly Kites Not Drones workshops with young people. 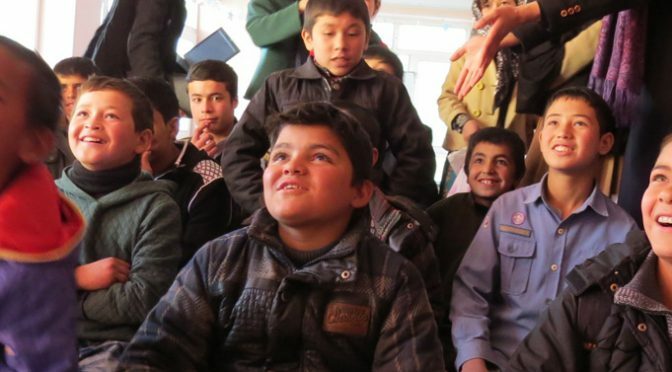 Both projects will link closely with the Afghan Peace Volunteers in Kabul, either connecting with them directly, or using them as inspiration or an example of activism in a difficult environment. Working with refugees in the UK, we hope to empower and develop confidence and campaigning skills with some of the most vulnerable currently living in UK society. The project aims to enable refugees to share their stories, while also harnessing activist skills to counter animosity and explain the difficulties involved in gaining leave to remain. The football team comprises of mixed ethnic players who are combining the message of peace and co-operation amongst the different ethnic groups. I had spent so much time praying about, discussing, protesting against UK involvement in NATO’s wars, my heart knew the true next step was to visit the site of so much suffering. At the same time I was nervous and found it difficult to work out why I was going or what I was going to do when I got there. Travelling to Afghanistan in a group, we could make the situation for our hosts potentially more dangerous. I recognised my heart was telling me to go, I recognised the Spirit was calling me to go, but my understanding had a difficult time catching up. It castigated me for causing too much bother, for spending too much money, for putting lives in danger, for missing family Christmas. It came up with a thousand excuses. Afghanistan is a beautiful country like all countries are beautiful; the snowcapped mountain range hovers over the smog; on a clear day the sky is the most intense blue I have ever seen. Sometimes it was so cold the open sewer in the street was frozen over, but during the day kept us warm. 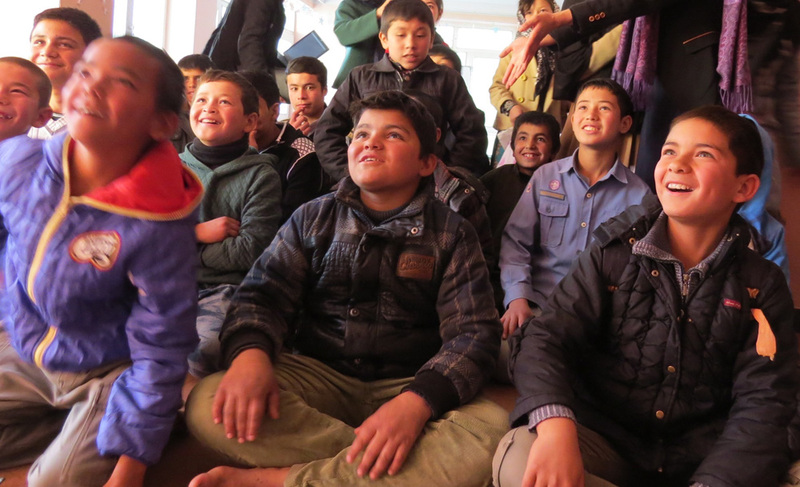 I listened to the friendly, young Afghans as they talked about their homes in Bamyam province. I looked at their pictures of child shepherds, rivers, trees, mountains. Once I said, ‘What a beautiful day!’ and my new friends laughed. ‘This is Afghanistan. There is a war on.’ But it was a beautiful day. The smog had been blown away. The green flag of faith on the top of the building opposite and the washing lines on the balconies were all fluttering. People were standing on street corners, gesticulating, chatting. Students were being students. I felt excited to be in what felt like the centre of the world; Russia to the north, China and Pakistan to the east, Iran to the west. Another message I held close to my heart is one inspired by scripture but also a practical one. Our trip wasn’t going to be very long, only three weeks. What could I do in three weeks? What skills could I possibly bring? I’m a literacy teacher, but only in English, not Dari. I’m not a journalist. I know nothing of aid work. On the Sunday of Christ the Kind I sat in my local church searching and searching for an answer. Why was I going to Kabul? I went through the works of mercy, the gospel reading for that day. Separate the sheep from the goats. Feed the hungry. It’s not helpful the other members of my group said, to take food to the refugee camps. We could cause a riot. Clothe me when I am naked. As westerners, our group had a dim view of that too. Gloves and socks and pants? We hadn’t raised money to buy food or clothes. I’m not a journalist so I can’t add an eye witness account. ‘Absorb!’ the rest of the group told me. I was thirsty and you gave me drink. There was fantastic hospitality in Kabul. Everywhere we went, a large pot of green tea came out, hot, steaming, weak and left on top of the wood stove to keep warm. It was served with a thermos of hot water, sometimes flavoured with cardamom. You could drink the plain hot water or use it to top up your glass of tea. In the morning our young hostess came rushing in to put glasses of tea by our beds. After the first night I woke up with my throat sore and feeling as if it was full of gravel. Our hosts said, ‘You’re not drinking enough.’ Fumes from the wood, coal and diesel that people burn to keep warm, fills the atmosphere with a strange yellow smell, which burns the throat and nostrils. Going through the works of mercy, I came to the last one. I was sick and in prison and you visited me. I was all those things. But this was something I could do. I do know how to do this. Hospitals are full of visitors. I have sat beside the beds of elderly relatives often enough, felt embarrassed, been told to go away. When someone is sick, they’re not polite. All I can do is sit there. There is not much I can do except stay a while. And just be. That was what I could do in Afghanistan. I was visiting; nothing grand. The country is sick, from lack of infrastructure, from the effects of one war piled upon another war, from lack of manufacturing base, from pollution. And the young people are imprisoned by lack of opportunity, unemployment, uncertainty, the unpredictable security situation. So this was the main reason to go, to be a person who visited. It gave me great courage, while I was in Kabul, to obey these words of encouragement from scripture. This was the answer we got from most of the people we met in Kabul when we asked “what do you want to say to British people?” The Afghans we met were well aware that the United States is spending nearly $2 billion a week on the war and the British around £1.6 billion a year since 2001. Of this, 94% of (US) spending was on the military and only 6% on diplomacy and aid between 2001 and 2009. 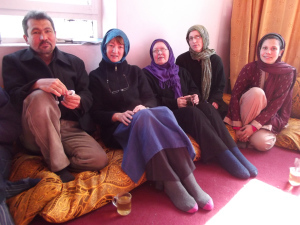 Our hosts in Kabul, the Afghan Peace Volunteers, have dedicated themselves to living non-violently and to helping the poor. Their witness for peace extends to a network of like-minded people who we were introduced to. Afghans are sick and tired of war and of living with fear and insecurity. In thirty five years of war two million Afghans have died and many more have been physically and psychologically maimed; more again have left the country and are living in exile as refugees. They long for more than an absence of war. We heard from everyone that they need jobs, education and health services for sustainable peace, and justice. Human rights activists say the country is doomed to repeat its violent past if abuses are not brought to light and prosecuted. Justice is something which all ethnicities, factions and religious persuasions can unite around and it offers a nonviolent way forward for resolving the conflicts and hurt. As well as current grievances about government corruption and the perception that officials and politicians pocket all the foreign aid, there is also the problem of the past and the perpetrators of crimes against humanity – many of whom are allegedly among the politicians and government officials in post today. We met a representative from the Transitional Justice Group (TJG) which is an umbrella group of forty grassroots organisations asking the Afghan government for a system of transitional justice. As well as this the TJG want a network for the victims of war to be formed to empower them to speak out about the crimes meted out to them. Some victims are beginning to speak out but do so in fear of retribution from the perpetrators. Outside of Kabul the victims have no voice to speak out. The same war criminals are in power in the regions as committed the crimes, so speaking out for victims can be lethally dangerous. 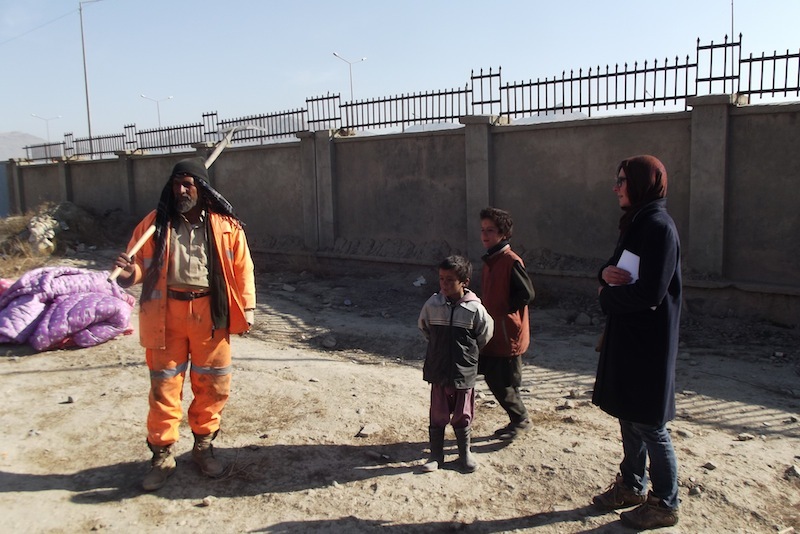 The TJG’s hope is to work outwards from Kabul to empower the people to speak out and to make the provincial officials and politicians accountable for their crimes against humanity. The TJG want all war criminals to be brought to justice and to ensure that none will be given positions of power. The Afghan government has responded to the evidence of the crimes by granting an amnesty to all war criminals for crimes committed before 2001. It was in 2001 that the transitional government lead by President Hamid Karzai was formed, and therefore the amnesty removes the threat of prosecution from those in power now. The Afghan Independent Human Rights Commission (AIHRC) produced the report a year ago outlining their research into massacres and war crimes for the period 1978-2011. The report, “Conflict Mapping in Afghanistan Since 1978” was compiled from interviews with the families of victims of war by forty researchers over six years and was commissioned by the Afghan government. The findings in the 800-page document include evidence of 180 mass graves, killings of civilians and prisoners, arbitrary arrests, forced disappearances, and the destruction of towns and villages. The report gave rise to controversy because of the names it named and the Afghan government will not publish it. Many of the names mentioned in the report were Mujahedeen war criminals which are now in the government. The AIHRC is still demanding that the report is released into the public domain, locally and internationally. 1. Acknowledge the suffering of the Afghan people. 10th December has been designated a special day for the recognition of the victims of war. Memorials have been established and museums created about the lives of the wars’ victims and their families. 2. Ensure credible and accountable state institutions. The government should be able to set up processes to try the perpetrators/criminals. But this hasn’t happened to date. The conflict mapping report which documents the war crimes and the conflicts that have happened in the last three decades has been submitted but not published. It is still with the President’s office. 4. Promotion of reconciliation and national unity. This would entail, amongst other things, a process being set up to hold war criminals accountable and to try them in court. Ideally it would be followed by a procedure between the families of victims of war and the war criminals whereby they could forgive the crime or demand the due process of law. President Hamid Karzai has refused to extend the action plan for transitional justice which expired in March 2009 and which failed to achieve most of its targets, according to human rights groups. A “Catch 22” is that the war criminals are seen as needed in the negotiations to bring the war to an end, but threatening them with prosecution is an obstacle to getting them to the table. 1) Disarmament, Demobilization and Reintegration (DDR). AIHRC sees this as a failed programme adding that “no one has been able to disarm the Afghans”. 2) The government has been releasing Taliban prisoners from Pakistan and Afghanistan. This is dangerous the TJG thinks because the Taliban’s ideology is still for an ‘Islamic Emirate of Afghanistan’. And this policy is bound to fail because these people are also guilty of terrible war crimes. We also met with one of the member groups of the TJG which works with the families of victims of war called the Social Association of Afghan Justice Seekers. 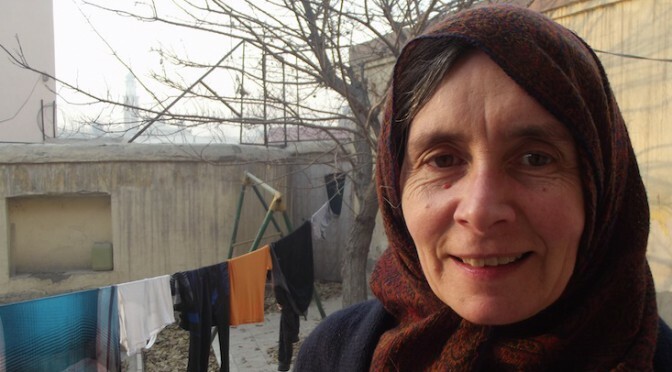 The woman spokesperson said that the biggest problem is that the people who perpetrated the crimes against humanity are still in positions of power in the Afghan government. She added that regrettably the US/NATO forces who have occupied the country for the last 11 years are complicit in these crimes and they themselves have committed war crimes in the provinces. She says that no conflict in any other country has been resolved by military force from foreign countries and no foreign force can bring peace to Afghanistan by military means. She added that it’s clear to her that no foreign force is in Afghanistan to bring peace, democracy and justice but only to serve their own interests. The Afghans sense that the international community is tired of waging war and they will pull out leaving them in the lurch. In the TJG’s view more and more options are being offered which will allow the Taliban to return to power, for example, by negotiating with them. The Taliban’s rhetoric is that negotiating a settlement with the international community will mean that they have ‘won’ and that this will sit well with the rest of the Islamic world. Then there is the added danger that the Taliban will get money and weapons support to regain power as well as getting regional kudos. We met people who remembered Kabul during the last Taliban regime and they were deeply concerned about a repeat of that reign of repression and terror. What can British people do? British people are asked to consider how their tax pays for pointless and ineffective military intervention and how it bolsters a corrupt government whose members are strongly implicated in war crimes. We were asked to encourage the British government to look at a peace process which is good for the people of Afghanistan, and not just the ruling elite and the military. Internal prejudices and internal divisions have always been there and foreign military interventions have simply exacerbated the ethnic and religious divisions. The people of Pakistan also need processes of justice. The British government should hold the Pakistan government accountable for training and sending increasing numbers of Taliban across the border into Afghanistan which exacerbates the conflict. The Afghan Transitional Justice Group believe the people of Afghanistan want justice but there is not enough international support or active groups in Afghanistan demanding it. On the one hand, Afghans differ greatly in how justice should be brought to Afghanistan, and on the other hand, the international community seems to think that weapons are the only way to enforce justice in Afghanistan. The TJG believes judicial processes are needed for a sustainable peace. Without justice there cannot be peace.